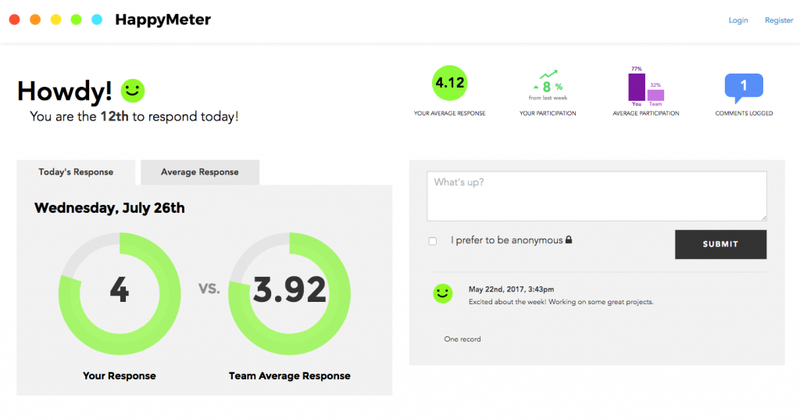 Last week, we launched HappyMeter on Product Hunt. 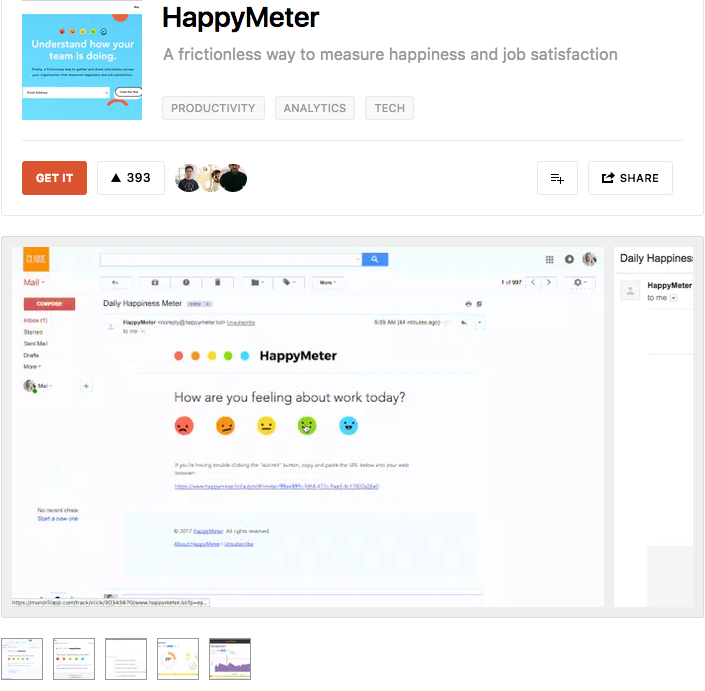 For those who don’t already know, HappyMeter is a culture analytics tool with the ambitious goal of making teams happier, because we believe happy teams are productive teams. Product Hunt is “…a massive community of innovators and early adopters that can jumpstart your product. So if you want to launch a tech product or service you have to launch it on Product Hunt” (Ovi Negrean, foundr magazine). Anybody can launch their product on Product Hunt. That’s the beauty of it. But just because anyone can, doesn’t mean everyone should. The PH community is open to trying new products, but the product needs to be good. It has to be interesting to the audience. So when should you launch on Product Hunt? We’ve been working for months to test, implement feedback, and revise to make HappyMeter ready for a public launch. Product Hunt is best for launching products that are unique. The more unique, the better the outcome—Hunters (and all of us, really) get excited by cool technology, and as a result, the products do well. Companies considering if PH might be a good place for them to launch their product should consider that it is most effective for either building brand awareness or driving immediate sign-ups. We can certainly think of a few of our clients who have “huntable” products worth submitting! We view Product Hunt as a very cost-effective social channel to launch a product on. We figured we could pay for ads and essentially buy new users otherwise, or we could acquire users for free through this community of early adopters. More importantly, these early adopters all have significant experience with a wide variety of products, and thus offer strategic, insightful feedback that we wouldn’t otherwise receive. We’re providing something that creates value, and we want others to try it and get that value. Product Hunt was the means to do that for us. Six months ago, when we started the conversation about launching on Product Hunt, we knew we still had work to do to get it right. Our feedback-driven iterations led us to a more serious conversation about two months ago, when we felt HappyMeter was creating value. We read every how-to article and checked all the boxes we needed to get our ducks in a row for launch. It’s kind of like preparing to run a race. You hit all your distances and times, get the proper clothes and shoes, fuel your body as best you can the night before…then you hit the ground running on race day. We reached our product development goals, gathered the proper resources, networked as best we could, and hit the ground running on launch day. To arrive at the point where we were even having a serious conversation about a PH launch, we first needed to answer the question—is our product good enough for users to get value out of trying it? To do that, we did a fair amount of work improving our onboarding process so we felt confident that after new users signed up, they’d be able to use HappyMeter efficiently and effectively. Once we acquired enough users through direct sales and knew it was delivering value, we felt we would be able to retain the new customers that signed up through PH. We started engaging influencers and friends early on, being as strategic as possible. Your network can only help you so much. This is a situation where quality reigns over quantity, as different votes for your product carry different weights. Some boxes you’re in charge of checking yourself to prepare, but one of the most important steps requires other people—specifically Hunters. 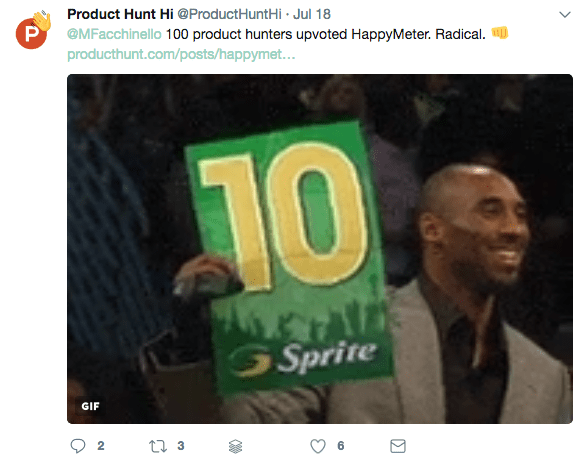 Having an established Hunter post your product practically ensures it will be seen by more people, and by more influential people, as they tend to have the most (and most powerful) followers. “We looked at top Hunters, specifically those who hunted similar products in the past, and asked for their feedback. Hunters are incentivized to want to post good products, so the real challenge is just getting through all the noise. 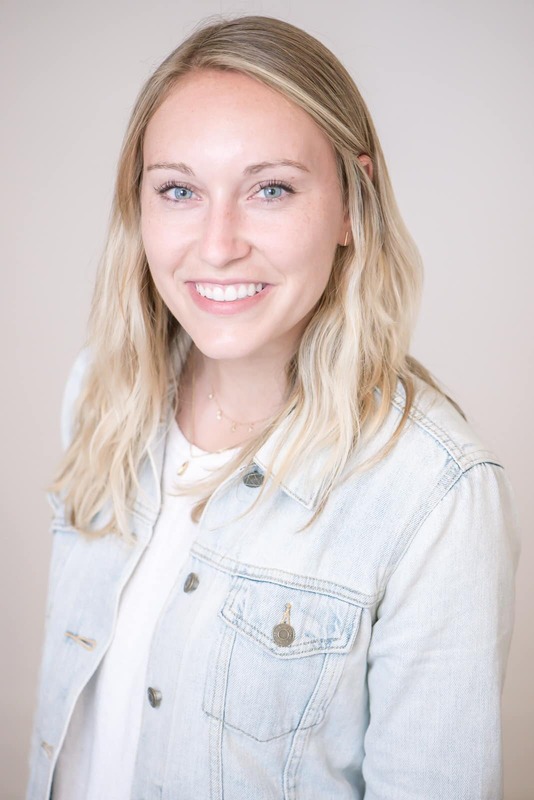 Once you’re able to connect with them, let your product speak for itself,” says Brent. Thanks to all of our prep work beforehand, hustling the day of, and influence of Andrew Ettinger, the Hunter who posted our product, we had an incredibly successful product launch (those first two links share our actual launch planning for you to reference if you’re considering launching on PH 🙂 ). On the Product Hunt site, we received 350+ upvotes (and counting) and were in the top 6 products for the day. We were most excited about the 80+ signups we received in the first 24 hours. 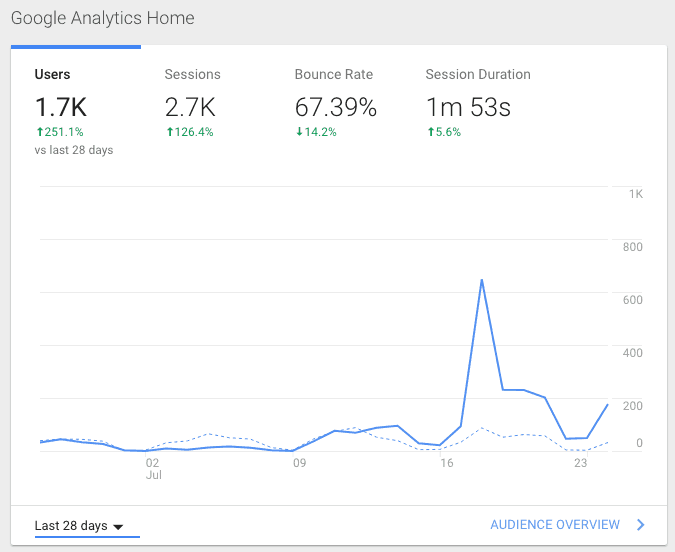 There was a 624% increase in traffic to our website, with over 30% of that from outside the US. We came into this day with no expectations set, and it exceeded anything we could’ve hoped for. While the initial 24 hours are the most crucial for a successful launch, your product doesn’t disappear into cyberspace. If you do well in the first day, it stays on the homepage one, two, even three days or more after your launch. We’re still getting new sign-ups, and while we credit leveraging the Product Hunt community, we also credit our amazing product development team for building something people actually want to use. We learned that we would do some things differently next time around, specifically working to establish relationships with more than one Hunter. Ideally, we’d connect with 3-5 well-known PH influencers and get them onboard, or at least get their feedback. Like we said, quality over quantity here—their eyes on a product mean more than most, and the insights and expertise they bring to the table are unquantifiable. There’s no silver bullet to a successful Product Hunt launch. There’s a bunch of lead bullets—you have to try a lot of them and if you get enough right, it will likely go well. We learned from our experience that it’s about being as proactive as possible to grow your product and your network beforehand, and then go all in on the day of launch to get as many eyes on it as possible. We kept our main goal in focus, though, reminding ourselves that this was about launching a successful product, not just about a vote count. We were most interested in user feedback and collecting ideas so as to continue to innovate and create value. HappyMeter was born out of our own need to connect with our employees as Clique Studios grew. With that growth, we began to feel like we weren’t as connected and in sync as we once were. So, true to our core identity, we decided to build something. Our office space, team size, and project list may have changed, but the engagement and support of our team has always been at the top of the list. HappyMeter has proved an incredibly impactful tool, opening communication channels within our organization about everything from how to moderate noise in our space, to how to improve our project process and manage workload. We’re a stronger team for having built and used it, and we are so excited to share it with the wider community and see its impact extend beyond our office walls. HappyMeter is all about transparency and feedback, and we couldn’t think of a better way to ensure its success than to ask for feedback from the Product Hunt community.